As a reliable Importer, Exporter, and Distributor, S. M. Shah & Company offers low-speed high torqueIntermot NHM Series Radial Piston Motors (hydraulic) with high displacement & torque. We primarily deal in Intermot Nhm Series, which is a low noise motor due to an eccentric crankshaft & low vibration frequency of five piston design. Due to high starting torque & good stability it rotates under very low speed. There are seals between piston and cylinder which give high capacity efficiency & less leakage with high reliability. 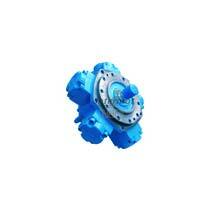 Oil is supplied by the pump to the distributor valve spool of the motor. The valve directs the oil in to two cylinders. The crankshaft rotates as piston in these cylinders push down on its drum. The remaining cylinders exhaust their oil back through the valve to exhaust port. The valve is keyed to the crankshaft so both rotate together and port oil to each cylinder in succession. Roller bearings are used in between crankshaft & connecting rod which give high mechanical efficiency. These motors have reversible rotation & output shaft can bear axial & radial loads. These motors have versatile construction design, high power and low weight. Has high power to weight ratio, volume, weight, relatively small.